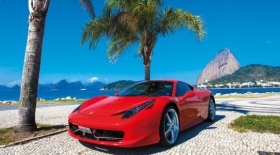 Men - The Ferrari Guide: Rio de Janeiro! With a number of high-profile international events scheduled for Rio, leading up to the Olympic Games in 2016, many works are being carried out throughout the city, with the harbour area in particular all set for a complete renovation. For now, the best way to discover this enchanting place is a slow meandering walk, letting all your senses be assaulted by downtown Rio. (tabacariaafricana.com), while for some fine seafood, try Albamar (albamar.com.br), set in a tower of the old Municipal Market. The restaurant on the third floor has a very tropical atmosphere, with extensive views across Guanabara Bay, where boats can be seen moving towards the direction of Niteroi. Over on Rua da Carioca, nestled among the area’s traditional stores, is the 100-year-old Bar Luiz (barluiz.com.br) where, as well as a delicious cold draft beer, you can also enjoy some traditional German cuisine.